Whether it’s “horns down,” Darrell Royal accusing Barry Switzer of spying or Brian Bosworth’s critique of vomit-inducing burnt orange, a rivalry that dates to 1900 has more than its share of antics and lore. And the 114th meeting Saturday — the second this season and with the Big 12 championship at stake — is well on its way to producing its own. Dial back to Oct. 6, when No. 9 Texas beat No. 4 Oklahoma 48-45, a game that showcased two stellar performances from the opposing quarterbacks. Sam Ehlinger passed for 314 yards, ran for 72 yards and accounted for five touchdowns for the Longhorns while Oklahoma’s Kyler Murray passed for 304 yards, ran for 92 and had five total TDs. Ehlinger insisted Tuesday it wasn’t a message intended for Murray. But did he tell Murray to “take your loss” after the first game? “I don’t remember what I said,” Ehlinger said with a shrug. As for the “no comment” from Murray, “I’d absolutely love to comment on that. 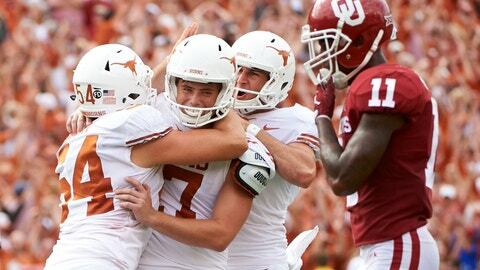 I absolutely respect his game,” Ehlinger said. Omenihu has taken shots at Murray before. After sacking Murray in the first meeting, Omenihu mimicked a baseball swing for a home run. Murray has already signed a professional baseball contract and he’s expected to leave football after this season to start his career with the Oakland A’s. Omenihu tweeted a photo of the swing on Monday. “I told y’all when I swung it was 450 feet,” he said. Oklahoma coach Lincoln Riley said he asked for some guidance from the Big 12 whether his players will be penalized if they flash the “horns down” hand signal on Saturday. The gesture drew flags for West Virginia when the Mountaineers played Texas. “I will make sure it’s fully clear to our guys what they can and can’t do,” Riley said. Of course, telling Oklahoma players they can’t do it in the game against Texas might be the same as asking them to play while handcuffed. The Big 12 on Wednesday reiterated its position that unsportsmanlike conduct calls are made at the discretion of game officials. The series was never hotter than the dust-up between Royal and Switzer in ’76. Royal accused Switzer of sending spies to scout the Longhorns, and challenged Switzer, his assistant coach and the alleged spy to take a polygraph test with a $10,000 reward if they could pass it. Royal also referred to the Sooners as “sorry bastards.” That prompted Oklahoma fans to chant the slogan outside Royal’s Dallas hotel and during the game, which ended in a tie. President Gerald Ford was at the game for the coin toss but even he couldn’t get the coaches to speak to each other before the game.